The desire for smooth, hydrated, forever-youthful skin fuels a multi-billion dollar cosmetic industry. The new wonder ingredient in skin care is ceramides, marketed as being vital to hydrating skin and preserving a youthful appearance. Ceramides are keys to maintaining the moisture and protective barrier of the surface of the skin and to keeping the skin renewed. However, whether or not they are the key to skin care remains to be seen. Ceramides are a group of natural waxy, fatty substances in the skin, composed of sphingosine and lipids (fatty acids) bonded together. They are present in all cell layers of the skin. Ceramides make up about 50% of all skin lipids and are made in the lower, living cells of the epidermis. As the cells change and move to the surface, ceramides are released to the topmost layer, the stratum corneum. In the stratum corneum layer, ceramides combine with cholesterol and fatty acids in equal amounts to form an ordered, tightly-packed, layered, sheet-like arrangement between the dead cells. There are nine different ceramides present in human skin. Ceramides 3 and 2 are most frequently used in cosmetics. Ceramides are also found in all tissues of the body, in animals, and in many food sources, including whole-grain wheat, brown rice, sweet potato, millet, soybeans, spinach, eggs and dairy products. They create a protective, water-tight barrier in the stratum corneum on the skin's surface to trap moisture in the skin and keep microorganisms and the environment out. In the deeper, living cell layers of the dermis and epidermis, ceramides act as a signal to promote cell death and renewal, from the inner to outer layers. This is important in aspects of skin maintenance (homeostasis), rejuvenation, and skin aging. An example of the presence of ceramides is the waxy substance, called the vermix caseosa, present on the skin of a newborn baby. 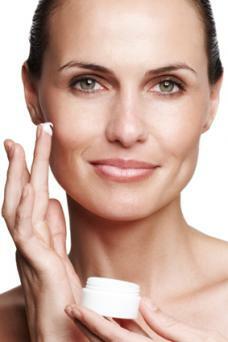 There appear to be fewer ceramides present in sun-damaged and aging skin. Cell layers are not refreshed as often in aging skin and the stratum corneum barrier is more prone to lose moisture. This is felt to contribute to the dryer (xerosis), duller and rougher appearance of aging skin. In skin conditions, such as atopic dermatitis (eczema) and psoriasis, dryness, flaking, and itching of skin are present. In these conditions ceramides are decreased and the sheets between cells are disordered, decreasing the skin's barrier. Many of the studies on ceramides' role in skin have used atopic dermatitis as the testing model. Ceramides used in cosmetics and dietary supplements are currently are either synthesized or extracted mostly from whole grain wheat and brown rice as well as from sweet potato, and konjac tuber. According to a Cosmetics Ingredients Review (CIR) report on the safety of ceramides, there is 0.2% or less ceramides in the available skin care products. None of the companies that produce or market ceramide products show conclusive proof of these claims. In addition, there are not enough clinical studies with large groups of participants to definitively support the claims that ceramides applied to skin, or taken by mouth, is the key to keeping skin young and hydrated. Curél® claims that with ceramides, "Curél® moisturizers work at the source of dryness to strengthen skin's moisture retaining capacity, unlike other moisturizers." Their goal is to "replenish and repair skin by forming a protective barrier." CeraVe® has been making a less expensive line of ceramide products since 2005. Their products are formulated for dry skin and for skin conditions like eczema and psoriasis. They claim benefits such as: "helps repair, replenish and protect the skin barrier to leave your skin looking and feeling soft, clean and healthy." Because of the tight barrier of the stratum corneum, it is difficult for ceramide creams and serums to penetrate into the layers of cells of the epidermis. This is where the idea for taking ceramides in pill form comes in. Perform their role in renewing skin cells "from the inside out"
Integrate between the cells of the stratum corneum to perform its protective role and keep the skin hydrated. Of note, phyto-ceramides were deemed safe and approved by the U.S. Food and Drug Administration (FDA) as a diet supplement. The long use of ceramides in Japan and their safety data played a part in the FDA's approval and are referenced in the FDA report. There are studies that show promising benefits of ceramides in treating atopic dermatitis. There are few clinical studies, however, that clearly prove benefits of either topical ceramides or oral phyto-ceramides in normal and aging skin. In a 2007 Japanese study published in Rinsho Byori, The Japanese Journal of Clinical Pathology, 23 patients were treated with a plant-derived ceramide cream and also tested with oral ceramides. The authors found a significant decrease in water loss in leg skin treated with either topical or oral ceramides. No clinical signs of improvement in dryness or wrinkles were reported. A 2002 French study published in the Journal of the European Academy of Dermatology and Venereology compared two different mixtures of ceramide creams in subjects treated for two weeks. They concluded that the mixture with a variety of ceramides, plus cholesterol and lipids led to more skin hydration than one with two different ceramides. A 2008 study published in the International Journal of Immunopathology and Pharmacology tested the forearms of 20 healthy women using a bacteria that caused ceramides to be increased in the skin. Researchers found an increase in skin hydration after two weeks of application. A 2010 study published in Acta Dermato-Venereologica compared skin hydration and ceramide levels in 55 male and female participants of a variety of ages. They found no relationship in perception of skin dryness to ceramide level, or differences in ceramide levels between young and old skin. In a further Japanese study, a group of students were given rice-derived ceramide pills or a placebo pill for six weeks. This study looked at improvement in roughness and furrows in the skin using a special photographic scan. In addition they measured water content and evaluated skin dryness and oil content. In all measures, there was significant improvement in the treated vs the placebo group. The role ceramides play in maintaining the skin's moisture and protective barrier and in ongoing skin renewal is evident from scientific data. How well this science has been translated into the effectiveness of current skin care products and pills, however, is unclear. Skin care products containing ceramides appear to be safe, but more clinical studies are needed to prove benefits as claimed. In addition to considering ceramide products, learn how to prevent wrinkles and investigate other recommended products to care for and protect your skin. You can find skin care products containing ceramides in drugstores, health and beauty supply stores and other retailers that carry skin care products and dietary supplements. Options include cleansers, lotions, serums, creams, moisturizers for face and body, eye creams, lipsticks and supplements.